Out of fun, I would like to analyze the drawings presented in each episode because they can give a lot of clues about the situation of our protagonists. In the first episode, I took a picture of this scene because it reveals a lot about CSH. She is a princess living in a huge palast. However, when she is introduced, she is alone in a small pavilion next to the castle. Not only she lives far away from the commoners, she is also alone in her castle. Another observation is the size of the princess. While she is wandering alone (yellow arrow), she seems so small compared to the castle and the flying horse. All this outlines not only her powerlessness but her loneliness too. Striking is the color of that scene: this world is so dark underlining the coldness of her world. This is indeed a depressing world, however the action of the princess (leaving the castle and walking alone) reveals one positive aspect: her curiosity and her desire to get close to people. In the beginning of that scene, we saw her looking from her pavilion to the outside word. This really shows how uncomfortable she feels in that huge and cold palace. Everything appears to be so dark, yet on the other side there is this young man living in a multicolored world. After travelling, CSH is able to leave that black world behind and meets our hero on Cuba. Striking in this scene is the contrast between the first scene and this one. There are the sun and the moon shining, we can feel the warmth from that drawing. For CSH, this must be quite a happy experience. The other difference is the size of our characters. They are both equally "small" compared to the world (moon, tree, sea, cloud). The equity in size shows that CSH is not different from JH in wealth. Then the "princess" is not just black, there is gold and yellow on her dress. So this illustrates that she is feeling differently from before (first drawing): she is opening up and even warming up. It indicates a happy time for her too. In this scene, JH is much smaller than the princess CSH which outlines that their position have changed. This outlines the great gap between her social status and his. Moreover, the rich clothes and ornaments contrast with the simple clothes JH is wearing. This reinforces the great difference in wealth and social position between our protagonists. We can also observe another contrast: JH is the only one who is moving. He is free, unlike CSH who can not move because there is this castle behind her. It looks as if the castle and the princess would be only one body. You can not separate them from each other. In my opinion, our heroine is portrayed as a imprisoned princess but from JH's perspective, she doesn't seem to be trapped as the castle is behind her. Another interesting observation is the red shoe. Like I had mentioned it before, red is linked to blood, life and passion. By offering her a shoe, JH is bringing life and light into her "world". With a red shoe, she will feel alive again. Since I have already analysed this fourth drawing in a former post, I won't repeat myself. But I posted it again for another purpose. You will find out it later. In the final drawing from the last episode, we can see another difference between the second and third picture. Our protagonists are together again, yet the distance has been reduced to the point that they are now together. Notice that on Cuba, the distance between them was huge, in the scene where he offers the red shoe, JH is already very close to CSH. He is even "speaking" to her with his gesture. While they were just facing each other (second and third picture), here they are facing their enemies. Now, they are even touching each other, JH is holding CSH's hand. What also caught my attention is that while they are looking at the snakes, it seems that they are acting together without speaking to each other. It was as if JH knew what CSH needs, just like CSH knows what she needs to do. Both are protecting each other without asking each other before. This drawing reveals how their relationship has changed. They are no longer strangers, rather quite intimate. Finally, I would like to point out, all these drawing have something in common: the color black. So the viewers can see that this is a rather cold world. Even on Cuba, the tree doesn't look green but dark brown and black which indicates that CSH is not able to leave this dark and cold world behind, even if she left her country/"palace". Remember that she couldn't meet JH at the cafe due to her business with the new hotel. Sokcho Park Sokcho is the popular drama 'Boyfriend' starring Sokcho Woncheon ~ The lighting improvement project is also completed, and Sokcho beach is expected to become popular as a tourist spot for four seasons. According to Sokcho on 9th of March, 851m of walkway was connected to 890m of Uongechi-dong road and Uonjechi beach-Sokcho beach south gate of Sokcho, but it was not connected 270m to the main gate of Sokcho beach, so the demand of citizens and tourists to use the promenade continued . The city started construction last October, extending the promenade, and replacing the old landscape lighting, and recently completed a 2,011 meter ocean fragrance road from the old town to Sokcho beach. As the scent of the sea, it was selected as the walking tour route of December recommended by the Korea Tourism Organization. Also, as it is known as the popular drama `Boyfriend 'shooting site, it is expected to increase the number of tourists. Said. Chung Soon-hee, director of tourism, said, "We will continue to improve facilities, such as repairing a member of the Sokcho beach front gate next year, in order to create a four-season residential tourist resort, . @bebebisous33 (yey i got the @ right!) thanks much for the insights on those amazing artwork. can't wait to do my own screengrab and do my own reading of the materials. this other art dept work is very much consistent with the rest of the storytelling visuals of the drama -- symbolical, multi-level and beautifully executed. really remind me of French fairy tale books. 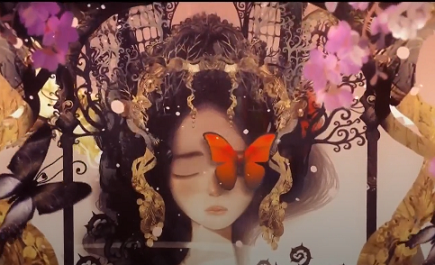 i am still curious to understand that artwork with the butterfly. i've read another post here with a very rich 'Psyche' interpretation, but i still want to know more. and i must say this forum is really a wealth of interpretation and insights. i have even started a file to paste some of the posts, just so i can get back to them at a later time. thats' what a good drama does to its audience. it makes us come alive. here's to a new week ahead with our Princess and Boyfriend! I don't like the ex- husband. Re-watching ep 4 again, made me dislike him more. He does know how to earn brownie points from CH and yet he did it only once in their entire marriage, and now here he is like a student cramming for the final exam. Unlike JH, at this early stage, he knows how. Between JH's " i brought this for you on my way here" over WS's " i picked it up on my way here", she chose JH's. This means many things, even simple gesture can flutter her, JH is more sincere, etc. I believed SH saw her ex's car when they arrived at the parking lot. Now, i'm intrigue, why many scenes of Mr. Nam and Mrs Kim( PR dep't) together. Does the scene of Hye In lowering her head at the playground means surrender and total acceptance? After watching the 4 episodes, I've wondered many times how Cha Soo Hyun could hold out after what she has gone through...a mother who "pawned" her to fulfill her obssessive ambition of advancing her husband's political career, a loveless marriage made worse by a mother in-law whose sole purpose in life is the flourishing of the Taegyong Congomerate and the protection of her family's reputation as it impacts on the business, being subjected to an unreasonable, shackling divorce settlement, becoming a "media prey" most, if not all, of her waking hours. Anyone would have caved in a long time ago. The answer? Her deep concern and consideration for her father. Cha Soo Hyun is holding out because of her father's well-being, reputation and political career. You see this is Episode 2 when she reunites with her parents after her Cuban trip, and in Episode 3 when she calls her father to express her concern with regard to the impact of her "ramyun date scandal" on his work. Several have accused CSH's father as a spineless man who couldn't rein in his wife, I wil not venture into that. What I would like to draw attention to is his relationship with his daughter: One of warmth and genuine concern asking her to get enough rest after her Cuban trip, assuring her (not berating her at all!) that the ramyun date scandal has not adversely affected his job, and instead, advising her not to skip her meals, expressing relief and joy at finding out from his friend, Mr. Nam, that his daughter is taking the "blows" well. The scene where CSH celebrates her birthday with her parents and her father's gift was the same poetry book that Kim Jin Hyuk gave her...So like Jin Huk, CSH's appa is a lover of poetry! Cha Soo Hyun ask her father if he also like this particular poet and he answered in the affirmative. And then the father asked Soo Hyun if she also liked the poet. And my heart fluttered wildly with her answer! CSH: "Yes, I am starting to like him!" I don't think I am over-interpreting it when I say this has "double meaning": That CSH directs this "I am starting to like him" to both the poet and Kim Jin Hyuk! I think Cha Soo Hyun's father and Kim Jin Hyuk will hit it off well if ever they get the chance to meet as they are both good men (if he is a friend of Mr. Nam and we know how grounded this Cupid Guardian is, I think CHS's father is, too.) and both are lovers of poetry. There's something I'd like to ask. I understand JH's behavior so far - it is in line with his character. But there is one scene about SH that I kinda find rather odd: the scene where she asks JH who he was talking to on the phone. Is she curious and jealous or what? At that point, to her JH is no more than a friend - someone nice who she spends a memorable day with. She seems a little bit dissapointed but then eventually is fine, thinking that he really has a girl friend. That does not stop her from wanting to spend her day with JH because it is not like she expect anything more than friendship from him. I appreciate that SH is honest to her feeling and shows she does care about JH, which makes him find her cute. But is that kinda out of character? Of all the things SH ever says or does to JH, for me this is the one where the boundary of flirting and normal friendship is blurry the most. I can understand other actions, like why she comes to the playground or wants to eat ramen with JH. But that scene where she is curious why JH smiles so happily like that, I am not really sure her motive. I can only think of two possible reasons which I think can be acceptable: (1) he used to laugh happily like that with her during their dance so she is curious who can also make him do so (2) if he does have a girlfriend, it is probably hard to hang out with him since it can make his girlfriend uncomfortable. Can anyone explain that scene to me? “Encounter” is the new hit tvN K-drama starring Park Bo Gum and Song Hye Kyo. The series started off strong, with breathtaking cinematography, solid storyline, and obviously the beautiful visuals courtesy of the two main leads. The high expectations that the series had set prior to the premiere were definitely met, and this past week’s episodes also proved to deliver. Here’s a look at five things we loved from episodes three and four. P.O finally makes his appearance in episode 3 as Kim Jin Myung, the aegyo-filled and adorable younger brother of Jin Hyeok. His character is exactly what you would have expected out of P.O. His energy and personality light up the screen and if the series wasn’t full of good characters already, P.O is the icing on top of the cake. It seems as though this family has a great relationship and even though the younger brother role might not be as significant, I’m really enjoying his scenes. It’s especially adorable seeing how tight-knit this family is and the heart-warming interactions Jin Myung has with Jin Hyeok. I’m definitely looking forward to seeing more of him in the episodes to come! When Manager Nam Myung Sik (Go Chang Suk) invites Kim Jin Hyeok to go see Cha Soo Hyun in the “business trip” to Sokcho, we know right away that he’s trying to set Jin Hyeok up with Soo Hyun and we love him for it. Manager Nam feels the need to bring joy into Soo Hyun’s life and he knows that involves Jin Hyeok. It was surprising to see the two meet so quickly after their scandal breaks out. Especially because Soo Hyun is in the public eye, I didn’t think Jin Hyeok would want to risk meeting each other, but I loved that they were able to reunite. Their chemistry is pretty undeniable and this particular part of the episode was so sweet. You could really feel Soo Hyun’s heart warming up to Jin Hyeok as she even laughs and smiles. I’m being told not to go, but there’s a road I wish to take. While being told not to meet, there’s someone I wish to meet. If you tell me not to, it makes me want to do it even more. That is life and longing. That is you. This poem is perfect in terms of embodying their relationship. They have feelings for each other, but it’s difficult for the two to be together because they’re from such different worlds. The poem is beautifully worded and is a not-so-subtle hint from Jin Hyeok, expressing his feelings for Soo Hyun. Jin Hyeok hears the song that he and Soo Hyun had listened to together on the radio in Cuba. This causes him to drive back to Sokcho to her hotel in the middle of the night. Although he has some serious feelings that compel him to go see her, he doesn’t tell Soo Hyun right away of his feelings. He makes an excuse about wanting to eat at a particular restaurant. When they sit down to eat, Soo Hyun pushes Jin Hyeok about why he had driven back to Sokcho and he finally confesses. This part was so romantic and sweet. Maybe it’s because of the innocence and purity that Park Bo Gum exudes through his character, but it was enough to give butterflies. It was also the first time one of the two make any mention of their ambiguous relationship, so it was refreshing to see him clear the air because we know that Soo Hyun can’t be the one to make moves on him, considering the scandal that broke out. I also loved the close-up of their shoes in this particular scene as it emphasizes the fact that they’re from totally different worlds. When Soo Hyun is confronted in the main lobby of her company about the rumors involving her and an employee, Jin Hyeok takes it upon himself to reveal that he is the employee she is having a relationship with. He calls out to her in the midst of the crowd and asks her to go eat ramyun with him. This particular confession scene was monumentally romantic for so many reasons, the main reason being that it was unpredictable. I would not have thought that Jin Hyeok would be that bold enough of a character to make that stand especially so early on in the series. And in front of all those workers! The anticipation of what he was going to say next after he called out to her totally had me on the edge of my seat. And the lines following were perfection. It’s a confession that was enough to take our breaths away and is probably one of my favorite K-drama scenes this year. Oh, the dread of having to wait another week! She just wanted to know who makes him smile like that soo brightly!! I don't think she has romantic kinda interest in it.. It's just her curiosity!! I guess she also wanted that kind of joy.. She wanted experience that kind of happiness in life.. She mentioned abt girlfriend stuff when he gave her his phone number.. She didn't wanna make his relationship to wrong if he was having one.. It's both but the latter, i.e., jealousy was prompted by her Secretary/best friend's response to CSH's query that most likely he was talking to his girlfriend, given the loving and smiling expression on his face (as noticed and commented on by CSH). Cha Soo Hyun is very aware of Kim Jin Hyuk. The way she stopped in her Welcome Address when she saw him and the immediacy with which she saw him outside talking on the phone is very telling. If that were to happen in real life, we would readily think its jealousy working here. I was amused by Cha Soo Hyun precision: 12:42pm! I mean, how can you remember such a detail if you're not interested in the person and why would you even ask if you're not? She even brought this up when Jin Hyuk was giving her his number. This means it bothered her and the only plausible reason to her actions is jealousy. Human psychology would attest to it. Why, it even bothered Cha Soo Hyun that Jin Hyuk's heart fluttered for Korean beef! [Herald reporter Chun Yoon-hye] TVN drama 'Boyfriend' in TV drama buzzworthy category, announced on December 10, 2018, is the first place for two consecutive weeks. At the same time, Park Bo Gum and Song Hye-kyo kept first and second place for the most buzzworthy actor/actress for two consecutive weeks. From second to fourth place, JTBC 'SKY Castle', tvN 'Memories of Alhambra Palace', and SBS 'Empress of the Empress' were ranked. However, as the topic rankings are the same, the gap between the top two 'boyfriend' and the second, third, and fourth films is narrowing to 2 ~ 5%. MBC 's new drama' Bad Detective 'was ranked 5th with Shin Ha - gyun' s acting , followed by SBS 's praise, JTBC' Let 's get hot clean', tvN ' Red Moon Blue Year ', and OCN' God's Quiz: Riboot 'were ranked from 6th to 10th respectively. This survey is based on the analysis of online articles, blogs, community, SNS, and video responses of 30 TV dramas that are being broadcasted or scheduled to be broadcasted from December 3, 2018 to December 9, 2018 by GOOD DATA CORPORATION. The results were announced on December 10. Thanks for this @utkim Boyfriend's lead from the other dramas has narrowed down to 2-5%. Of course, it very impressive that the main leads and the drama have both kept the no. 1 spot. Please support them by checking Naver and Daum daily.